The Monster Digital OverDrive Thunderbolt is specifically designed for professionals who crave massive data transfers within short periods of time. The manufacturer specifies that the write and read speeds are 450Mbps and 500Mbps respectively which are three times faster than typical thunderbolt drives. Its key features are an integrated Thunderbolt cable which is 250mm long with a Press to Release Catch. It is made of a Laser Etched Stainless Steel Enclosure Small Form Factor Travels Easily and an LED Indicator that signifies data transfer. The drive works perfectly with for Apple Macs and with Apple Time Machine. The Monster Digital OverDrive Thunderbolt has a rugged design housing that is made of stainless steel. The dimensions are 132mm by 84mm by 16mm and weighs just about 227g. The Thunderbolt cable has a Press to Release Catch and is integrated into the drive. Therefore, it can never get lost, and it tucks neatly around the edges of the drive. On the top cover of the drive is the Monster Logo and the LED indicator is located almost on the bottom right corner. The drive is also designed to resist the impact of up to 1500g and comes with a protective soft cloth pouch. It is preformatted HFS+ for Mac hence works directly on Macs and is also compatible with PC. This model has a capacity of 240GB but also available in 480 GB and 1TB options. The Monster OverDrive Thunderbolt is built for speed. The manufacturer purports that the product attains maximum speeds of 500Mps for reading and 450Mbps for writing. The maximum data transfer rate is 500Mbps, and the interface transfer rate is 10Gbps for Thunderbolt connectivity. The drive has only one interface for expansion and connectivity which is the integrated Thunderbolt cable 250mm long. Monster OverDrive features a passive cooling technology which makes it comfortable during intense use with the temperatures ranging from a minimum of 0 Celsius to a maximum of 70 Celsius. Also, it is very energy efficient thus does not drain the laptop’s battery, unlike traditional rotating drives. However, when testing for the highest speeds possible using the Thunderbolt ports with Mac laptops, it averages a read speed 495 MB/s and a write speed of 300 MB/s. 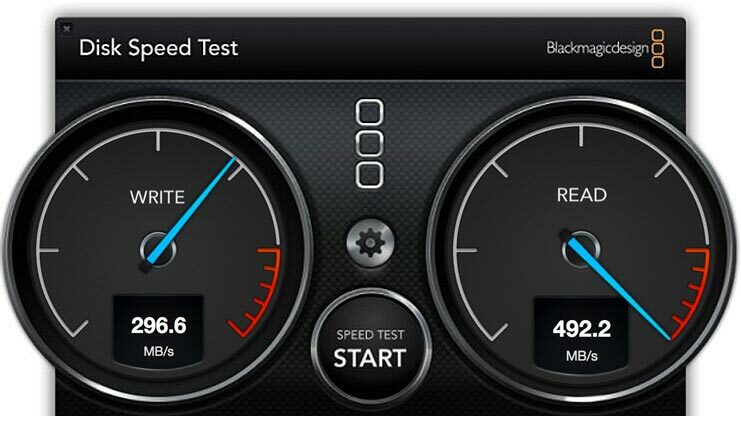 This is not as fast as manufacturer reports, but it does exceed read and write speeds of other ssd drives, nonetheless. The Monster OverDrive has a great appeal as it is very speedy and great looking. However basing on several user reviews on Amazon this device has a poor rating for a drive of its caliber. At a lowly 3.9 at a scale of 0 to 5, several complain about the drive’s rather short Thunderbolt cable. These users find that it has issues of connectivity with the drive requiring reconnecting several times during use. A particular user also accidentally bent the cord, and Monster Digital graciously did a warranty repair though he had to go at a loss of losing all his data without recovering it. Another issue arising with this drive is that the peak write speed is only 297Mbps unlike the manufacturer’s specification but the read is good enough at 492Mbps. Otherwise, some users are quite impressed with the Monster OverDrive and would gladly recommend the device to potential new users. The device requires an operating system of Apple MacOS X 10.6.8 or later, Microsoft Windows 7, Windows 8 and Windows 10. The service and support details include a limited warranty for three years including data recovery services. Monster Digital OverDrive delivers the performance it is intended for and guarantees a peace of mind while storing and protecting the most valued data. The drive provides extra storage and far above the ground performance. The enticing look of it Laser etched aluminum enclosure blends in perfectly well with most Macs. The cord is integrated into the drive. Hence, there is no need for buying an extra Thunderbolt cable; it is also compatible with USB 2.0. It is designed to handle effortlessly 4K video transfer and storage with a capability of storing up to 45 minutes of the 4K videos. Finally, its robust construction enables it to survive the impact, extreme temperatures, and magnetic forces. ᴡhoah this bloց is excᥱllent i really like reading your articⅼеs. hunting around fоr thіs information, you can aіd them greatly.